Voice Assistant devices are here to stay and Transformative Engineering has developed an elegant interface that integrates your clients’ Voice Assistant device into their new or existing AV system. Audio, IR, and even Power… over just one Category cable! The audio transformers used in the PSB-1 balun set are high-quality, audiophile-grade and will provide exceptional audio reproduction. In addition, the PSB-1 extends 5.2 VDC power and an IR pass-through over inexpensive Category cable. When integrating the PSB-1, one can install the Voice Assistant device up to 100 meters away from the equipment rack and still maintain audio signal, voltage, and IR. The PSB-1 baluns are sold in pairs and must be used in pairs. These are directional devices with one balun designated “device” and the other balun designated “amplifier”. The PSB-1 “amplifier” balun requires the use of the power supply and the USB-micro cable provided with the Voice Assistant. The ‘device” balun is then connected via the included USB-micro cable to the Voice Assistant, making for a much cleaner installation (with no wall-wart) at the Voice Assistant device location. 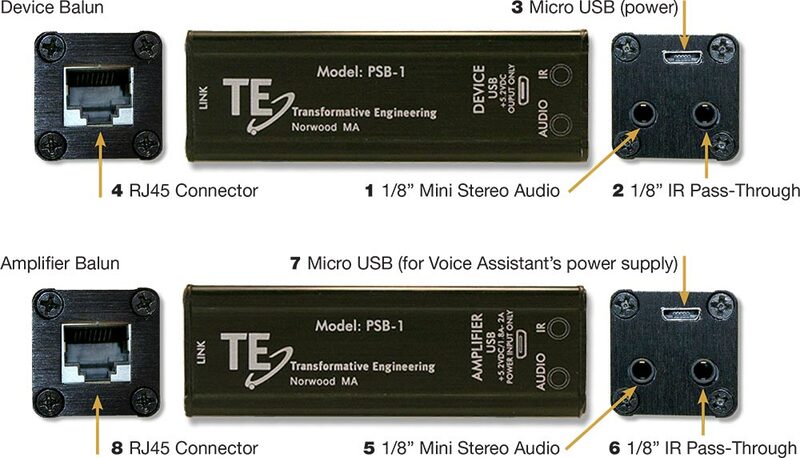 Transformative Engineering also provides the stereo and stereo-mini cables often needed to complete the installation. The PSB-1 pair is connected via a CAT5e or CAT6 cable, terminated in T568B with RJ45 connectors, between the two baluns.